Investing in alternative energy can be overwhelming if you don't understand the language of the industry. Below we have provided a glossary of the most common solar terminology and their definitions. 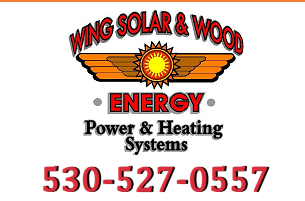 At Wing Solar & Wood Energy, Inc. we want you to fully understand the meaning of "Going Solar." If you have any questions or we can assist you in any way please do not hesitate to contact our office at 1-800-492-4061. The term Balance of System or BOS refers to anything in the system - wiring, nuts, bolts, etc. Building-Integrated Photovoltaics (BIPV) means utilizing photovoltaics (PV) in new construction. BIPV modules usually replace other building materials while also being used as power generators. These modules can be used in building facades, roofing, and awnings, and even glass. The charge controller regulates the electricity going into a battery. The charge controller also protects the battery charge during off hours. The disconnect switch is exactly that, the "off switch." The electric grid is sometimes referred as "the grid" because it is the system that delivers electricity from suppliers to the public. Electrical grids are comprised of generating stations, transmission lines, and distribution lines. An energy audit is an assessment that evaluates how much energy is being used in a home. An energy audit will also provide ideas for you to make your home or business more energy efficient. In addition, your energy audit can also find "problem areas" in your home or business that may, over time, be wasting energy, hence valuable dollars. An escalator is just another name for a rate increase. For example, if you are considering a lease or power purchase agreement (PPA), be sure to look for escalators. A feed-in tariff is a pricing policy that encourages homeowners to use renewable energy sources. Feed-in tariffs are long-term agreements that allow utility providers to buy energy from customers who use FIT-eligible resources to generate renewable energy. Rooftop solar panels are considered eligible for FIT programs, so solar users can receive payment for any electricity that is produced. A grid-connected/grid tied system is similar to an independent PV system. However, a grid-tied/grid connected system works simultaneously with a utility grid. Though PV systems can provide power without being connected to the grid they depend greatly on the sun. A home with a grid-connected system, on the other hand, can feed excess power back to the utility and draw energy from the grid in times when renewable resources are not available. Interconnection allows power to be transmitted between two parties. Linked transmission lines allow power to move back and forth. A solar inverter converts direct power to alternating current electricity. Solar DC power must be converted to AC electricity so it can be used in your home. A kilowatt or (kW) is a measure of power. A kilowatt-hour (kWh) is equivalent to one kilowatt (1 kW) of power expended for one hour of time. One megawatt (MW) equals 1000 kilowatts (kW). One megawatt hour (MWh) equals 100000 kilowatt-hours. The meter monitors energy production of your solar system. The mounting system of your solar system actually holds the solar panels in place. The NEC, also referred to as the NFPA 70, is a code of standard designed by the publication National Fire Protection Association that provides guidelines for electrical installations. Net metering is the billing system that allows users with a solar system to send unused solar energy back to the utility grid for other users. This system helps you, the solar customer save money on your utility bills. Peak sun hours should not to be confused with an hour of daylight. For example, one peak sun hour is one hour's worth of sunshine. Peak sun hours vary depending on the time of day, the season, a cloudy day and geography. The term photovoltaic (PV) comes from two root words: “photo” which means light and voltaic which means voltage. Solar cells, solar modules, and solar panels are often called PV cells, PV modules, and PV panels. Photovoltaic (PV) conversion efficiency is the percentage of solar energy that a photovoltaic cell can convert into usable electric power. This is a solar-purchasing contract. When a home builder installs a solar energy system on a customer's property, usually at little to no cost for the customer, the energy produced is sold to the customer at a set cost. When the agreement expires, the customer has the option to renew the contract, remove the equipment, or purchase the solar system at a reduced cost. Real-time pricing (RTP) is a type of time-varying rate that allows users to pay for the actual price of electricity and save on utilities by adjusting their own energy use during times of high or low demand. Smart grids are electrical grids that use digital technology, including computer-based automation, remote control, and two-way communication between a utility and its customers. Smart grids are also designed specifically to increase energy efficiency. A solar array is basically just another term a solar system. A solar cell is also called a photovoltaic (PV) cell which is the basic component of a solar panel. A solar farm is also called a solar ranch, solar field or solar park and can cover an area anywhere from one acre to a one hundred acres of solar panels. Solar farms allow a community to enjoy the benefits of a solar system without purchasing, installing, or maintaining individual systems. Solar insolation is a unit of measurement that calculates solar radiation energy. A solar lease is a payment option that allows you to make monthly payments to a solar provider. Much like any other loan, a solar loan allows you to enjoy the benefits of a solar system without the outright cost. Please check the guide to financing page of the site for further details. A solar panel is a group of solar cells that have been wired together to generate power. An SREC is similar to net metering in that yes you are getting money back from your solar system. However, a SREC is actually different with an SREC, your return is based on the current market value. Time of Use (TOU) is a type of rate-varying use (RVU) pricing which breaks out a 24 hour day into three or four time spaces. TOU is designed to encourage customers to consume their energy when demand is low, hence cheaper. Tracking mounts are designed to move the panels throughout the day so they will always face the sun. "True South" is not to be confused with magnetic south. An easy way to understand "True South" is when the sun is at its highest point in the sky and any shadow that is cast by perfectly vertical object the shadow will run perfect TRUE north-south. Each of us at Wing Solar & Wood Energy, Inc. hope that this page serves to be helpful as you are deciding whether "Going Solar" is the right decision for you.